Amazing new collection of weirdo folk/pop tunes, from Brattleboro's (see also: Blanch Blanche Blanche, Bruce Hart, Chris Wiesman, Son of Salami) most celebrated collective of folk/pop weirdos, Happy Jawbone Family Band. The Silk Pistol is their third, and possibly even their most eccentric full length to date, and it couldn't have found itself a more suitable home than on Shawn Reed's(Wet Hair) Night-People label. 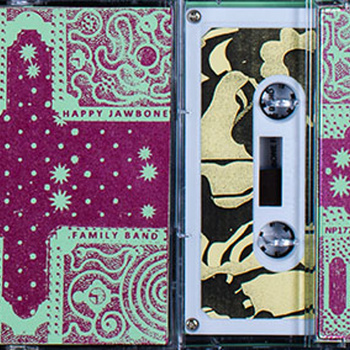 With two previous LP's on Feeding Tube Records, Happy Jawbone Family Band continue their quest into jangly garage/psych revivalism, only to float further away from a place that's overgrown with pretentious rehash, and drifting toward their own colorful hideout on a wave of loose arrangements and collaborative charm. The Silk Pistol hangs somewhere in between carefully crafted pop album and all out free-folk jam, dipping it's toes in just about everything else along the way. HJFB still conjure up more than a few moments of Nuggets style freak outs at times, but aside from the wide range of possible flower-era influences, this gang is generally pushing things in their own direction. The entire album has a sort of busted charm, and things tend to stay slightly out of tune in the best possible way. Group vocal harmonies, infectious guitar parts, and the occasional horn arrangement are definitely in their bag, but their bag is proving to be an odd shaped and constantly evolving one. Another giant notch in Brattleboro's musical bedpost, and another stunning HJFB release, perfect for late night back porch hangs.Highly recommended. Get a copy from Night-People.